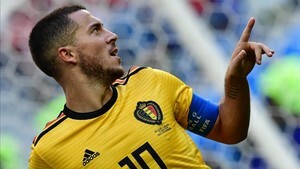 Eden Hazard, both Belgium and Chelsea's biggest star, has ignited the rumour mills across social media following his comments after Belgium's 2-0 victory over England. The forward, who ran the show as his country claimed third place at the World Cup, took advantage of the spotlight to call into doubt his future at Chelsea. "After six wonderful years at Chelsea it might be time to discover something different. Certainly after this World Cup. I can decide if I want to stay or go, but Chelsea will make the final decision - if they want to let me go. You know my preferred destination." This isn't the first time that Hazard has hinted at a move to Real Madrid. During the World Cup, where he still has a chance of being named the best player at the tournament, he said: "Madrid are a dream club, whether Zidane is there or not." Another signal that Hazard will do whatever it takes to join Real Madrid were the declarations by Brian Laudrup, brother to Michael and a former Chelsea player, to "Sportske Novosti" in his native Denmark: "I spoke with Hazard a few days ago and he told me that's he's preparing to join Madrid. I think it'll be a good decision for him as well as Real Madrid because you're talking about a world class player here."